There is never a good time for your automotive battery to die but there's nothing worse than getting stuck in the winter cold. 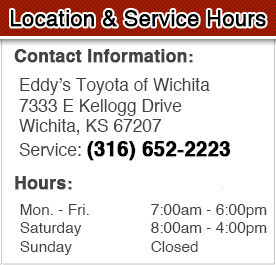 Make sure your car battery is ready for the coming Kansas winter--take advantage of a free battery test at Eddy's Toyota when you bring in this special coupon. Even if you don't drive a Toyota, we'll check the charge and load capacity of your battery to make sure your vehicle starts every time. Our experienced technicians have the knowledge to diagnose your battery and other potential problems. Don't end up stranded--take advantage of our complimentary battery test for your vehicle of any model with this special coupon.